Dream of being a botanist…. My bedroom was filled with plants. Long tendrils of glossy-leafed pothos vines snaked across my dresser, and a 5-foot-tall yucca tree bent over the foot of my bed toward the window. When my grandparents visited, they took my two younger siblings to Toys R Us to each pick out a toy. Afterward, we went to Home Depot, where I got to pick out a new ficus tree or an asparagus fern, maybe even a succulent. Until about the time I turned into an angsty, pubescent teenager, I delighted in gardening with my mother. A spider plant & a little potted cactus. I wound up becoming a journalist instead. Still, I am happiest — and, I’ve found, I do my best writing — when surrounded by greenery. As I type this now, my desk is fringed with a little Peruvian apple cactus, a spider plant, a milk cactus and a big, hardy jade plant. 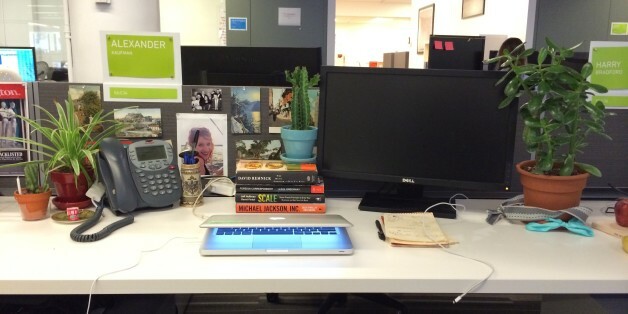 My little workstation garden might actually make me a more fruitful employee (or so I tell my editors). And now there’s research that seems to back that up. 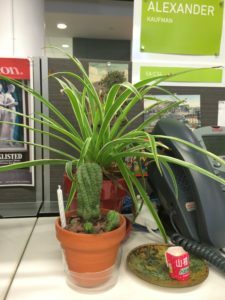 A study, led by Cardiff University’s School of Psychology and published last week, found that adding plants to an otherwise Spartan desk boosted a worker’s productivity by 15 percent. The results challenged the trendy belief that desktop minimalism, sometimes called lean management, breeds productivity. The researchers surveyed workers and monitored productivity at two large commercial office spaces — each with some offices stripped clean of office decor, others greened with plants — in the U.K. and the Netherlands for several months. I often shift my gaze to my potted milk cactus throughout the day. That, or the photo of my girlfriend, Charlotte, hung in the background. Nieuwenhuis concluded that landscaping an office with plants would be a worthwhile investment for companies, as it increases the quality of life and productivity for workers. Laboratory tests have yielded similar results. In a study published in 2011, a team of researchers in Norway tested a group of 34 student attention spans when reading. Half of the participants performed the task at bare, wooden desks. The others were tested at desks with flowers and foliage. On a second round of tests shortly after, scores improved for the students with plants. Those for students without plants stayed the same. A study published last year by the University of Exeter offered the most dramatic argument for keeping plants around. 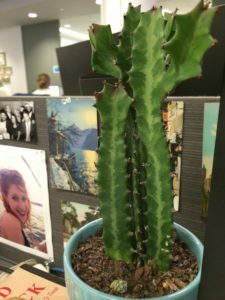 After running 90 tests on 350 participants, researchers found that office plants increased workers’ well-being by 47 percent, boosted creativity 45 percent and jolted productivity by 38 percent. So, what is it about plants that sharpens the mind? In the 1980s, Rachel and Stephen Kaplan, a pair of environmental psychology professors at the University of Michigan, developed the Attention Restoration Theory. The concept describes the way that being in nature, and focusing on the calming sway of leaves or flow of a brook, can remedy mental fatigue. No doubt, the daily barrage of digital distractions can be taxing. Constant blips on Gchat, the ever-flowing streams of TweetDeck, email after email — it gets to me sometimes. And while I’m a good multitasker, it’s hard to write when I’m playing a game of e-messaging Whac-A-Mole. But then I look up and trace the variegated patterns on a cactus or the browning lines of the jade plant as its stalk grows into wood, and I’m at peace.